Take sugar in a bowl and add 125gms of water. Heat the sugar mixture and cook on high flame till the sugar is dissolved and bubbles appear. Then lower the flame and cook stirring till a full one thread consistency is achieved i.e., between112oC & 115oC on candy thermometer. Then switch off the flame and add cardamom powder and mix. Then add powdered gram flour mixture and mix. Transfer the mixture to a mortar and pound it with the pestle till the mixture becomes uniform and soft. Smear some ghee on palms. While the mixture is still warm, take a portion of the prepared mixture and form smooth ball. After taking a portion of the mixture to form ball cover it to retain the warmth. Similarly make balls with the warm mixture and spread in a plate to cool completely. Serve the tasty thokkudu laddus to near and dear and enjoy. Frying the karapoosa in ghee gives a greater shelf life along with a nice aroma than frying in oil. Attaining the thread consistency for sugar syrup is important to bind the gram flour mixture. If the syrup is just sticky and has not reached one thread consistency then the laddus do not shape well---that means they appear like flat discs. If the syrup is cooked further and is more than one thread consistency stage then it becomes difficult to shape the laddus as on cooling it turns into powder soon. So cook sugar syrup consciously on low flame till good one thread consistency is reached. While pounding, the mixture attains smoothness as the hot syrup and the gram flour mixture becomes a uniform mixture. But it would be difficult to pound the mixture as the mixture is sticky and the pestle would not come out of the mixture so easily. 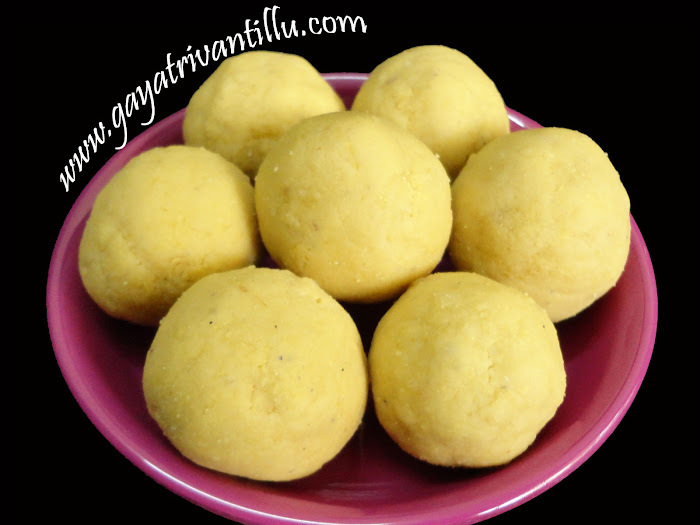 Pounding is called TOKKATAM in Telugu and hence the name Tokkudu Laddu. Pounding gives the smooth texture. Pound the mixture to the extent that one should be able to make laddus. While pounding as the mixture becomes a uniform mixture, it thickens. Do not pound the mixture to the extent it becomes dry and then it would become difficult to make laddus. With the measurements given above it makes 9 to 10 big sized laddus. As the measurements are given for a small quantity it would not be that difficult to pound the mixture---it hardly takes 5 to 6 minutes to pound the mixture.